I received a copy of this book through Net Galley in exchange for an unbiased review. Investigating the Hottie is a quick, cute read. When 15-year-old Amanda Peterson steps off the plane, she expects to spend her week long break with her free-spirited aunt. Her aunt, however, as it turns out is not so free-spirited and has big plans for Amanda's stay. Her aunt is a spy and her organization has been tracking young recruits, including Amanda, to help with certain operations. 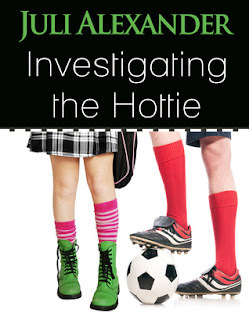 Amanda's assignments, should she choose to accept it, is to spend the week at a private school and get to know super hot soccer Will, a person of interest, as he is believed to be a hacker. The novel is well-paced and the connection between Amanda and Will stays PG (maybe PG-13 by the end). It's not insta-love. She acknowledges he is good looking and admits how he makes her feel, but the romance is relatively love key, good for younger YA readers. I'd say the target audience is 13-15. I enjoyed Amanda as a narrator, but my favorite character was actually the aunt, Christie. She's spunky. The banter between her and her spy partner Nic is great. I would have liked Will to have been more developed. Also, some of the kids at school seemed to be mean girls just for the sake of being mean, to add tension. While this does speak to a the high school experience, it was not needed. I would have liked to know more about the spy stuff. Amanda accepts it relatively quickly. Also, the resolution to the hacking situation seems too simple. This was a point where there could have been excellent tension and the author did not take advantage of it. Amanda and Will's relationship resolves satisfactorily. Overall, this was a fun story, a very quick read. It has the potential to be a series. In fact, I think that is the plan for it, and I'm glad because I would like to know more about Amanda and Will's adventures.I also want to see more of Christie and Nic. Getting my Steven Speilberg on!